With the colder weather fast approaching, it's time to think about extra skin protection. 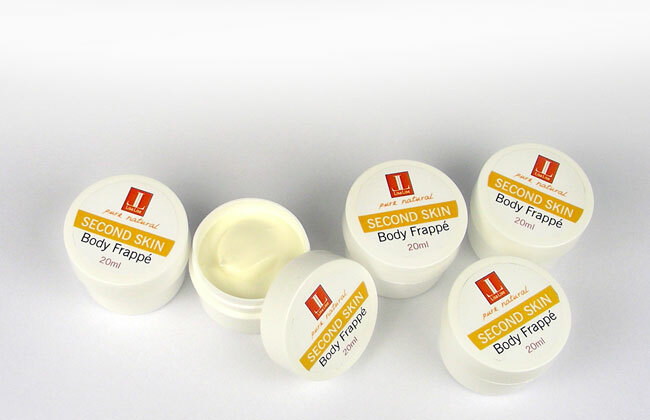 Here's something that may just fit the bill – just for you (and 4 other lucky winners) – Second Skin Body Frappé. This product has been a winner with the client it was developed for, my testers, and it has already become a staple amongst my daily-use products. This list is combined feedback from my clients, testers, as well as myself. Each of the pots above holds 20 ml - that's enough to last about a month if you use it daily as a hand cream. Drop a comment below before Sept 15, 12 noon (Copenhagen time), and 5 winners will be chosen and announced before Saturday the 21st. PS. Yes this is open to everyone - all over the world - so go for it! sounds interesting! Count me in! I'm not lucky for the lash conditioner but I'm not afraid to try again! Would love to try your product :) Count me in! Is the giveaway open internationally? If so, I'm in US and would love the opportunity to try this product. Thanks! That sounds delightful!! I am also in the US but I would love the chance to try your amazing product!! Oooh! I would love a chance to win and try this cream. I've always been terribly curious about your items and would absolutely love the opportunity to do so! The ingredients sound delightful! Wow - this product has wonderful natural ingredients - I would love to try it. Sounds divine - would love to try this. Ooh lala!! I'd love to try and buy! All your products are so awesome. I love how this can be used on the entire body. Oh totally missed this, I would have shared it for you.